And who felt the brunt of these oppressive taxes? Surely, not the rich, who benefited highly from them. Knowledge is not restricted to "book learning" but taking what you learned and use the facts for critical thinking. 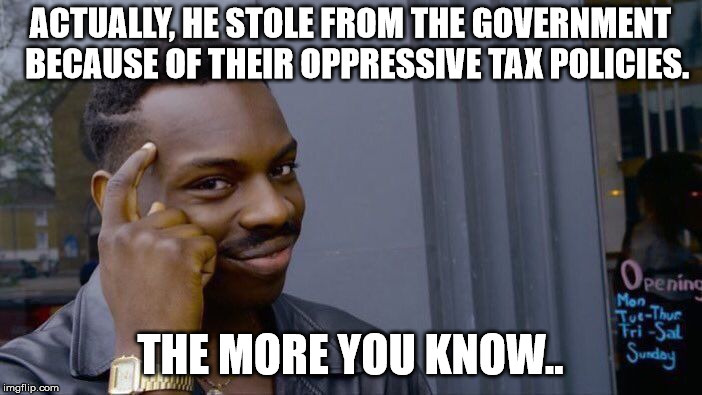 Oppressive taxes on everyday citizens was not restricted to Robin Hood's time. Jump a few years ahead to 18th century North America, where an actual revolution occurred over taxes. Guess who benefited from the taxes levied? Hint: more book learning: The East Tea Company of London. It's happening today in America. I wish people would learn the differences between the very separate political ideologies before spouting off. Education, it’s the missing link in politics today. I'M ROBIN HOOD. I ROB FROM THE RICH AND GIVE TO THE POOR; THAT'S COMMUNIST PROPAGANDA!! !